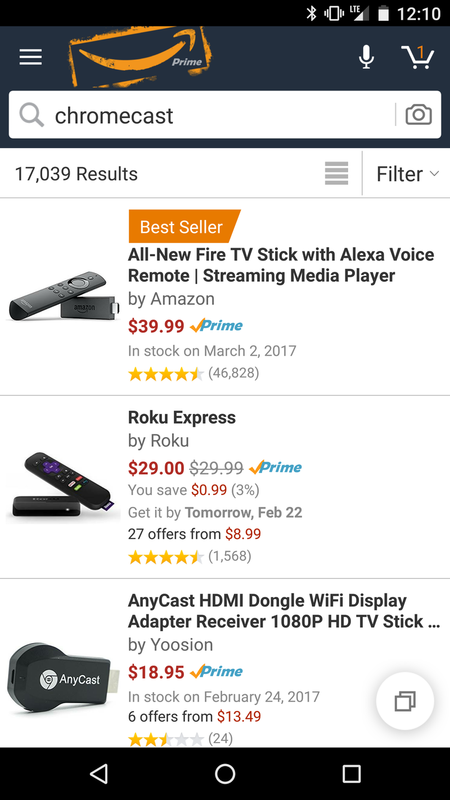 "Alexa, order me a Chromecast." Amazon is oh-so passive aggressive when it comes to Google products and streaming video. I’ve been meaning to get a Chromecast because Android screen mirroring on my Rokus only exists in theory. Lo and behold, Amazon doesn’t sell the Chromecast. This is on top of intentionally limiting their Instant Video app on Android to only SD video even though you can watch HD just fine using the exact same app on a Fire device, or iOS. They think they’re going to encourage people to buy Fire devices instead of Google, but I’m sticking with my Android phone & tablet, Rokus, and Chromecast, and if I want to buy a movie I’m not doing it through Amazon because I want to watch it on all of my screens in full quality.